Travel Associates is proud to be an authorised sub agent for Rugby World Cup 2019. Rugby’s toughest international tournament gets set to take place in Japan from 20 September to 2 November 2019, with the world’s top 20 teams going head to head for the Webb Ellis Cup. Travel Associates can help you enjoy all the tough-tackling action in the flesh, at what is one of the world’s premier sporting events. We've put together a selection of packages available. If you follow another team, please speak to your experience Travel Associates adviser for your tailor-made package. Call 13 70 71 or enquire online. Travel Deals Schedule Locations Snapshot Why Book With Us? 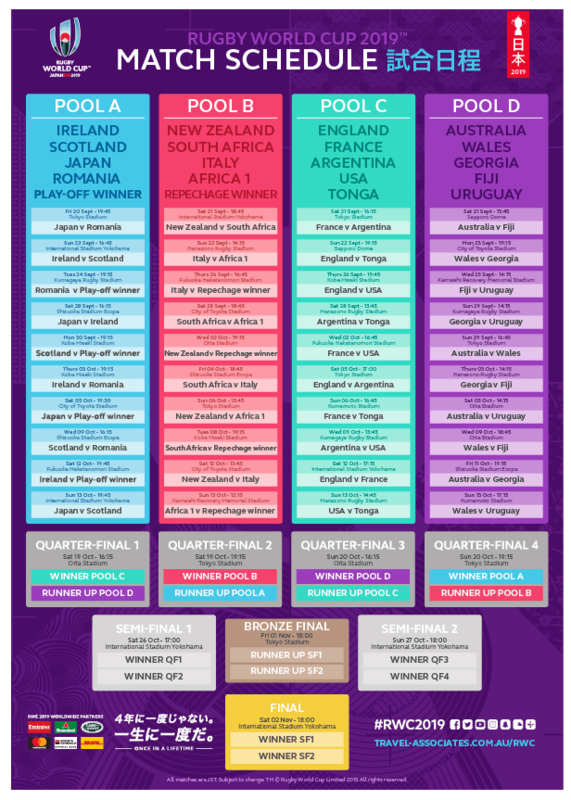 A Six Week Rugby World Cup Spectacular. Who will be left standing? The world’s best rugby teams square off on the field from 20 September to 2 November in 12 different sports stadiums across Japan. Teams in each of the four pools fight for the chance to make it to the qualifying position in the semi-finals. On Saturday, 26 October and Sunday 27 October, the four teams battle it out for the final two positions, and for the entry into the 2 November decider. Game dates, times and venues can be found in the handy Match Schedule below. Stadiums will see a rotating roster of teams playing at each venue. While most game dates are on the weekends, some matches are played on weekdays. Whether it’s the venerable Tokyo Stadium, Sapporo Dome, International Stadium Yokohama, or any of the other 9 big-league sports arenas, catching a Rugby World Cup match at any one of these iconic venues is bound to be a memorable experience. From the metropolitan sprawl of Tokyo to the Northern city of Sapporo to the Kumamoto region, the six-week sporting event is the perfect chance to enjoy the many popular destinations of Japan. The Rugby World Cup 2019 promises to be one of the most exciting sporting events of the year, in one of the world’s most exciting destinations. For the first time ever, the Rugby World Cup will be held outside of the heartland of rugby and instead in Japan – the perfect host nation and a rising star on the global rugby scene. Hosted once every four years, the Rugby World Cup is rugby's centrepiece event. Held over the course of seven weeks, it is the 3rd largest sports event in the world. The world’s top 20 teams will go head-to-head in a total of 48 matches at 12 venues across Japan – from Sapporo in the north to Mumamoto in Japan’s south. All teams will have their sights set on the coveted Webb Ellis Cup. Reigning champions New Zealand, two-time Rugby World Cup champions Australia and host-nation team Japan will be looking to go all the way in one of the world’s toughest sporting competitions, alongside usual contenders South Africa, England and France. The excitement kicks off in Tokyo Metropolitan, with the opening match to held at the renowned Tokyo Stadium, and the final match will be held at the International Stadium Yokohama in Kanagawa Prefecture, Yokohama City, which has the highest seating capacity of any stadium in Japan. The atmosphere is set to be nothing short of electric. You can catch all the action up close and in person in Japan courtesy of a boutique Travel Associates package, combining airfares, accommodation and exclusive match-day tickets. Let a premium travel brand help shape your unique sporting itinerary, and ensure Rugby World Cup 2019 is an event to remember. Preparing for a Rugby World Cup Tournament can be a daunting experience, particularly as a supporter. You want to make the most of your time there especially when you’re travelling a long way to soak it all up. Rugby World Cup 2019, played in Japan, kicks off at Tokyo Stadium in Tokyo Metropolitan on 20 September 2019 and concludes with the final at the International Stadium in Kanagawa Prefecture, Yokohama City on 2 November. Australia’s campaign commences on September 21st against Fiji. Whether you’re looking to be the team player and join a group departure around Japan or partake in a bespoke jaunt befitting a victorious captain, our Travel Associates advisers are only too happy to assist. From the big city lights of Tokyo to the quiet awe of standing under Mt Fuji's shadow your ultimate travel experience is unlimited. The siren has gone, the countdown is on, and the winner is determined by who has planned and prepared the best. To start planning your journey to Rugby World Cup 2019, simply enquire online or call 1800 017 849 to speak with one of our experienced advisers.